This is a carrot cake that a friend ordered for her own birthday. It's a triple-layer carrot cake filled and frosted with cream cheese frosting. I was free to decorate it as I wished, so I took the opportunity to try something new. 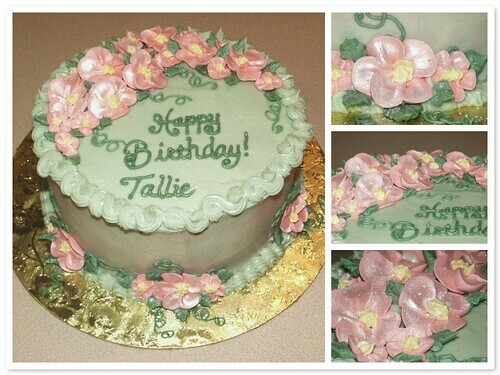 I found this Lilly Pulitzer-style cake created by Laurie Lucov Wedding Cakes . I liked the pink and green combination and the whimsical design. I thought I could interpret it in a single layer cake. But...the fates had a different idea. The chocolate transfers turned out horrible and my latticework looked even worse...I had to scrape off the latticework and re-smooth the cream cheese frosting...hence the marbled sides. I made a batch of royal icing and made the flowers, let them dry until they could be handled and arranged them on the cake. Once the cake was finished I thought something was missing, so I brushed it with shimmer dust. Most importantly - Tallie loved it! Happy Birthday, Tallie!